Guatemala's new President, Otto Perez Molina, said today he will propose that Central America legalize drugs at an upcoming meeting of leaders in the region. Does he mean it? Or is he only attempting to start a dialogue? A former military general who ran on a law and order platform promising an "iron fist" policy against organized crime, he authorized the army to join the fight against the drug cartels just one day after his inauguration..
Washington has spent billions of dollars to help push drug cartels out of Colombia, and to confront them in Mexico. 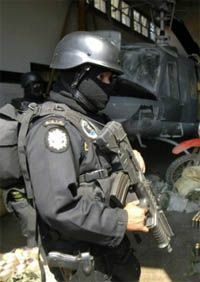 Now they've muscled their way into Central America, opening a new chapter in the drug war that almost certainly will exact further cost on U.S. taxpayers as American authorities confront drug gangs on a new frontier. If the victims came down with the disease, they were treated with antibiotics. The U.S. officially apologized today. The President of Guatamala appropriately expressed his outrage, calling the tests "crimes against humanity."